Determines whether a data re-request is needed. Notifies the object that a request was started. How long to wait before trying to re-request the data. How long to wait on the first attempt to get data. Timer for the current request. Time between requests of the same type. Maximum amount of pending requests. Timer used to separate requests, to avoid flooding the server. Template class for a piece of data that must be retrieved. This class handles the storage, retries and delays required to obtain a piece of data.. Definition at line 95 of file llfloateravatarlist.h. Definition at line 98 of file llfloateravatarlist.h. Definition at line 200 of file llfloateravatarlist.h. Definition at line 214 of file llfloateravatarlist.h. Referenced by LLFloaterAvatarList::getAvatarColor(), LLAvatarListEntry::getIsLinden(), LLFloaterAvatarList::refreshAvatarList(), and LLAvatarListEntry::setAccountCustomTitle(). Definition at line 186 of file llfloateravatarlist.h. Definition at line 155 of file llfloateravatarlist.h. Referenced by LLAvatarListDatum< LLAvatarInfo >::requestIfNeeded(). This function takes the decision based on whether the data has been already retrieved, the last data request was long enough ago, and the request rate being low enough. A FALSE return value doesn't mean that everything is OK, only that a retry shouldn't be made at this time. Definition at line 124 of file llfloateravatarlist.h. Definition at line 235 of file llfloateravatarlist.h. Definition at line 230 of file llfloateravatarlist.h. Definition at line 219 of file llfloateravatarlist.h. Referenced by LLFloaterAvatarList::processAvatarPropertiesReply(), and LLFloaterAvatarList::processTrustNetReply(). Definition at line 240 of file llfloateravatarlist.h. Definition at line 254 of file llfloateravatarlist.h. Referenced by LLAvatarListDatum< LLAvatarInfo >::LLAvatarListDatum(), and LLAvatarListDatum< LLAvatarInfo >::requestStarted(). Definition at line 289 of file llfloateravatarlist.h. Referenced by LLAvatarListDatum< LLAvatarInfo >::LLAvatarListDatum(), LLAvatarListDatum< LLAvatarInfo >::retryNeeded(), and LLAvatarListDatum< LLAvatarInfo >::setMaxPending(). Definition at line 261 of file llfloateravatarlist.h. Definition at line 278 of file llfloateravatarlist.h. Referenced by LLAvatarListDatum< LLAvatarInfo >::getStatus(), LLAvatarListDatum< LLAvatarInfo >::requestStarted(), LLAvatarListDatum< LLAvatarInfo >::retryNeeded(), and LLAvatarListDatum< LLAvatarInfo >::setValue(). Definition at line 284 of file llfloateravatarlist.h. 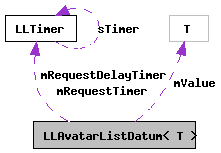 Referenced by LLAvatarListDatum< LLAvatarInfo >::LLAvatarListDatum(), LLAvatarListDatum< LLAvatarInfo >::retryNeeded(), and LLAvatarListDatum< LLAvatarInfo >::setRequestDelay(). Definition at line 273 of file llfloateravatarlist.h. Referenced by LLAvatarListDatum< LLAvatarInfo >::LLAvatarListDatum(), LLAvatarListDatum< LLAvatarInfo >::requestStarted(), and LLAvatarListDatum< LLAvatarInfo >::retryNeeded(). Definition at line 266 of file llfloateravatarlist.h. Referenced by LLAvatarListDatum< LLAvatarInfo >::getStatus(), LLAvatarListDatum< LLAvatarInfo >::LLAvatarListDatum(), LLAvatarListDatum< LLAvatarInfo >::requestStarted(), and LLAvatarListDatum< LLAvatarInfo >::retryNeeded(). Definition at line 249 of file llfloateravatarlist.h. Definition at line 243 of file llfloateravatarlist.h. Referenced by LLAvatarListDatum< LLAvatarInfo >::getStatus(), LLAvatarListDatum< LLAvatarInfo >::LLAvatarListDatum(), LLAvatarListDatum< LLAvatarInfo >::requestStarted(), LLAvatarListDatum< LLAvatarInfo >::retryNeeded(), and LLAvatarListDatum< LLAvatarInfo >::setValue(). Definition at line 241 of file llfloateravatarlist.h. Referenced by LLAvatarListDatum< LLAvatarInfo >::getValue(), and LLAvatarListDatum< LLAvatarInfo >::setValue().